But any angler who has actually used a fish finder knows that they are just that: fish locators, not fish catchers. Simply locating the fish, DelVisco preaches to audiences across the nation, is only the first part of the process of actually getting a bass, trout, walleye or panfish aboard your boat. Yet he admits it is a large part of the battle, made easier by the use of a remarkable electronic device that relies on sonar to locate items underwater. The basic components of a fish-finding sonar unit are a transmitter, receiver, transducer and a feedback device, which in the case of a modern fish finder is a display screen. In the simplest terms, sonar works when an electrical impulse from a transmitter is converted into a sound wave by a transducer and sent into the water. When this wave strikes an object (i.e. fish, structure or bottom) or reaches a significant gradient, as in a thermocline, a certain amount of the wave is reflected back depending on the composition, size and shape of the object. This reflected signal returns to the transducer where it’s electronically processed and sent to the display. Since the speed of sound in water is roughly 4,800 feet per second (depending on water temperature, salinity and depth), the time lapse between the transmitted signal and the received echo can be measured and the distance to the object determined. This process repeats itself up to 40 times per second, resulting in a continuous line being drawn across the display, showing the bottom signal. Simple sonar units, often called “depth finders” and offered as options on pleasure boats and sailboats, provide just that: information on water depth. Often they display nothing more than numerals noting the number of feet or fathoms between the boat’s hull and the bottom. Fish finders, however, are more sophisticated sonar systems that offer the sensitivity to find, mark and display the bottom as well as smaller objects in a cone-shaped water column beneath the boat’s hull. A fish finder’s display will show marks between the bottom line and the surface when the boat passes over objects such as fish that are suspended in the water. Some fish finders even offer side-scanning capabilities that provide information on fish and other features in front of, to the sides and behind the boat. The image shape and size that appears on the display depends on a number of factors: the sensitivity setting on the fish finder, the cone angle of the transducer, the speed of the boat, and the size, depth, speed and direction of the fish. A fish that is swimming directly beneath the boat will create a consistent echo that will cause a continuous line to appear on the display. But what type of line? If the finder employs a narrow-beam transducer, a stationary fish appears as a single point on the screen as the boat passes above it, whereas under the same conditions the fish appears as an arch if a wide-beam transducer is used. A “Fish ID” feature is incorporated in some Humminbird-brand fish finders to assist the angler. By automatically recognizing the echo from the fish, a fish icon is shown above the point or arch on the display screen. Additionally, with a multi-beam transducer that transmits beneath the boat, as well as to either side, the Fish ID software can distinguish the location of the fish in reference to the boat and display the icon appropriately. A solid fish icon is displayed when the fish is beneath the boat and an outlined icon is shown when it is detected on either side. Optionally, a fish alarm can sound to draw the angler’s attention to the fish as they are detected. SONAR: Not just for submarines. The word “SONAR” originated during World War II as an acronym for SOund, NAvigation and Ranging, when the technology was developed by the U.S. Navy to find and track submarines. THERMOCLINE: Some like it cool. Thermoclines are layers in a body of water where colder water intersects or mixes with warmer water. These layers serve to separate the cold water from the warm water. Because the speed of sound is heavily dependent on water temperature, these areas of temperature variance – when the differences are large enough – sometimes allow the return of echoes to the sonar. Fish often suspend in thermoclines as they seek cooler water, so knowing where the thermocline is can help the angler locate the fish. The transducer is the part of the fish finder that sends and receives the sound pulses, transforming the electric transmit signal into a mechanical acoustical wave that can travel through water. The transducer is usually mounted on the transom of a boat, or in the bottom of the hull, at or below the waterline. The transducer concentrates the sound wave from the sonar unit into what is referred to as a beam; for most fish finders the beam shape is a circular cone. When a pulse of sound is transmitted from the transducer it spreads out over a wide area as its range increases. If the amount of beam spread vs. depth were plotted, you would notice that it generates a cone-shaped pattern, hence the term “cone angle.” The sound is greatest along the center axis and diminishes as you move away from the center. Transducers come in various beam widths. Wider cone-angle transducers give more coverage for a given depth; however, they cannot penetrate as deep in the water as a narrow cone-angle transducer for the same frequency and power input. In deep water a narrow cone-angle transducer is more appropriate because it will have the higher power-per-unit area. In shallow waters, a wide-beam transducer is the better choice for the broader area it will cover. Some new fish finder units allow you to switch between wide- and narrow-angle transducers. Okay, so there are the fish. Now what? There’s an adage “one-fish-on-the-stringer-is-worth-ten-on-the-screen.” It holds true even when you have located an entire school of fish beneath your boat; you still have no guarantee of getting one to bite. But simply knowing they are there gives the average angler the optimism that he or she may need to stick it out long enough – and work hard enough – to hook up. 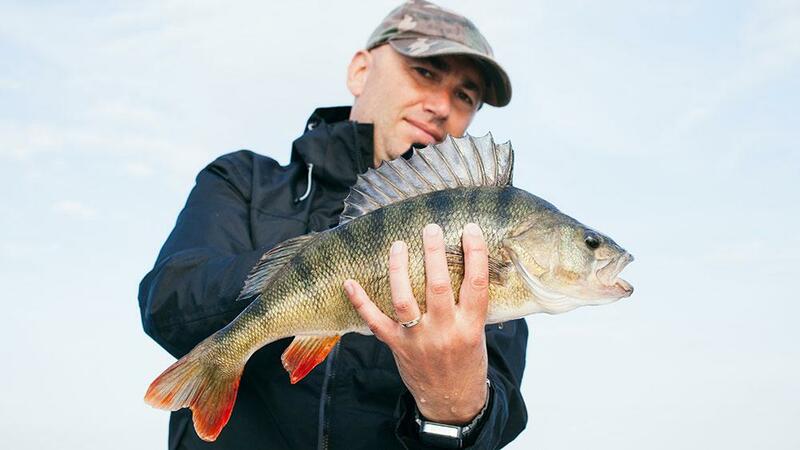 Fish finders also can offer savvy fishermen other information that might abbreviate what some consider a tedious (and others refer to as fun) trial-and-error process. For example, most fish finders will allow you to determine at what depth the fish are swimming. Some sonars even have a feature that displays each fish’s depth in numerals with a mark that notes its presence; other models display a scale to the side that gives you an idea of the depth of the fish being marked. Using that information, if you are bobber fishing, you can set the float on your line to suspend your bait at the depth where the fish are. If casting or trolling artificial lures, you can select the ones made to run at that depth and pull them through the area, being reasonably confident that the fish can see them. The fish finder’s display screen can also give you other information that can help you hook the fish you’ve located. For example, if the large marks that show game fish are near lots of smaller marks or a cloud of “mini-marks,” that means the game fish are hanging around – and perhaps feeding upon – a school of smaller baitfish. That tells you to use lures or baits that mimic the local baitfish in size, shape and color. If the fish marks are holding close to a jagged bottom line on your screen, that means they are near rocks and may be feeding on crayfish. Fish shown finning over weeds may eat just about anything. So try live bait such as worms or minnows and artificial lures such as minnow-imitating crankbaits, jigs or spoons until you find the right combination and hook up. *The Paul Bunyan State has since allowed anglers the use of electronic fish finders, but has more recently debated the sportsmanship of using underwater cameras for finding fish. Dan Armitage is an outdoor writer and host of “The Buckeye Sportsman” radio show in Ohio, where he’s rehabbing a 1930s fishing cabin on the Kokosing River. Dan also conducts fishing and outdoor photography seminars at sport shows across the nation.